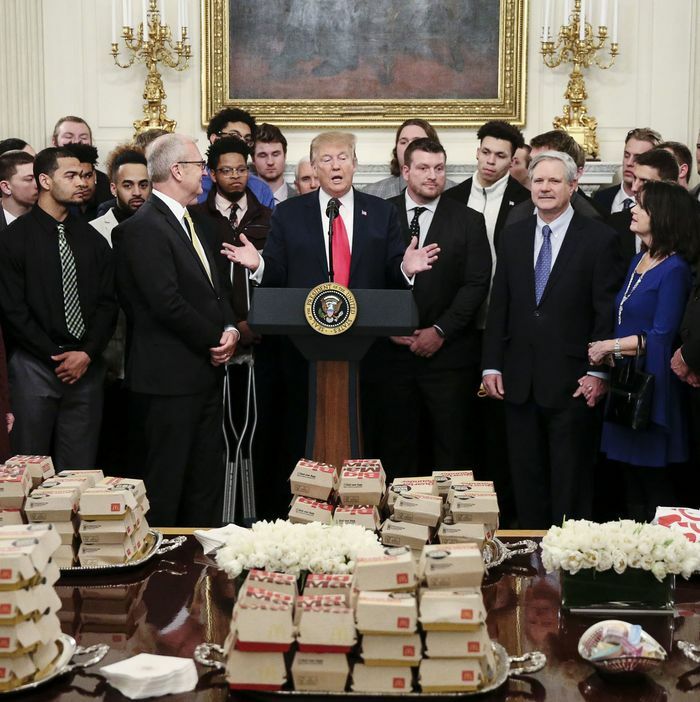 The last time President Trump served fast food to a group of college athletes, we were in the midst of a government shutdown. (Remember that nightmare?) It seemed like a sad one-off, a blip in an administration already known, if not downright expected, to buck tradition. But it appears that ordering massive amounts of fast food for college-aged kids is now a thing. As Newsday White House correspondent Laura Figueroa Hernandez points out, Trump honored the North Dakota State University football team today, winners of the NCAA Division I Football Championship Game, by serving them McDonald’s and Chick-fil-A. To add further insult, according to Hernandez, Trump also served McDonald’s French fries by the cup (why? ), yet failed to order Chick-fil-A’s far-superior waffle fries.